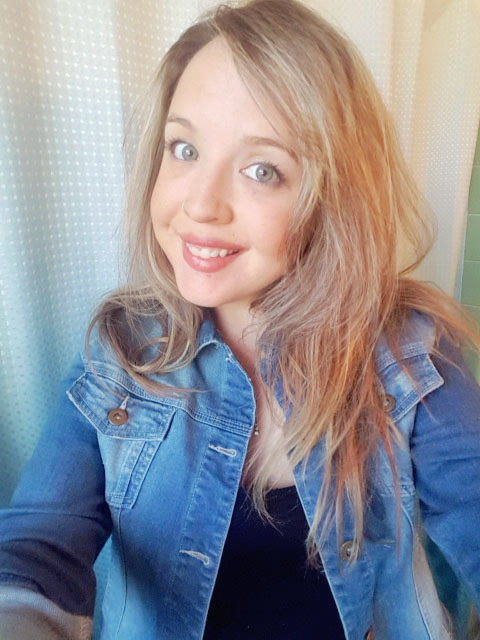 While I keep talking about being pregnant, sharing little tidbits of information about my little darling in posts here and there... I have yet to officially make a post all about this experience of carrying a life inside me, although it's been on my to-do list for weeks. 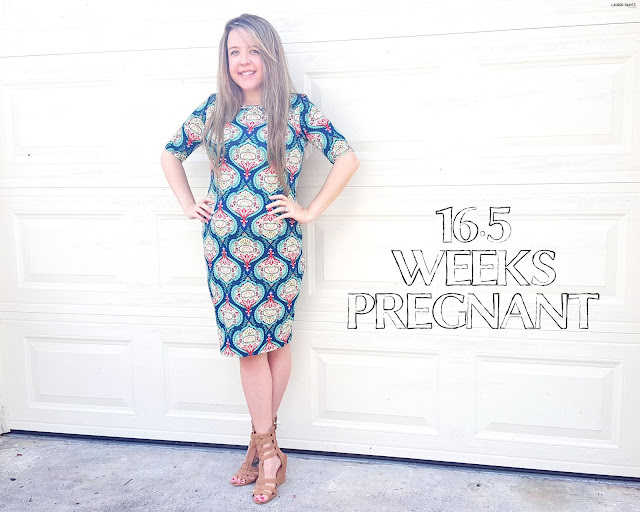 So instead of procrastinating any longer, today's post is all about my ever-growing baby bump and all the joy (and struggles) I've experienced thus far. We'll start out by backing up a little bit... My first trimester was full of nothing but feeling like hell, to put it nicely. I spent hours feeling nauseous, I could barely eat without getting sick, and while I knew this was likely to happen... I didn't realize I would spend several weeks feeling like I had the stomach flu or food poisoning. With that said, going into the second trimester, I was finally able to resume a semi-normal life and start eating again. Other than feeling ill the first few months, I suppose I should address the fact that I was a walking ball of hot mess as well. I would (and still do) cry at the drop of a hat, sometimes literally. This, yet again, was something I had heard from other mama's-to-be but had no idea how crazy I would feel with all these hormones raging through me. From crying at silly, sweet stories on Facebook to worrying about complications, I've been a bit of an emotional roller coaster but it'll all be worth it in the long run! We've been calling our little babe, "our pineapple". I'm not even sure why it started but it's stuck around pretty much since we found out. Speaking of finding out, I actually took a test on a whim because my monthly friend was late and wa-bam... There were two lines almost instantly. I couldn't even speak other than saying "OH MY GOD" over and over again. Hubby came flying in the room and his face lit up when he realized I wasn't hurt and that I was holding a pregnancy test. We had to go buy another, just as any rational couple would do... and again it was positive. 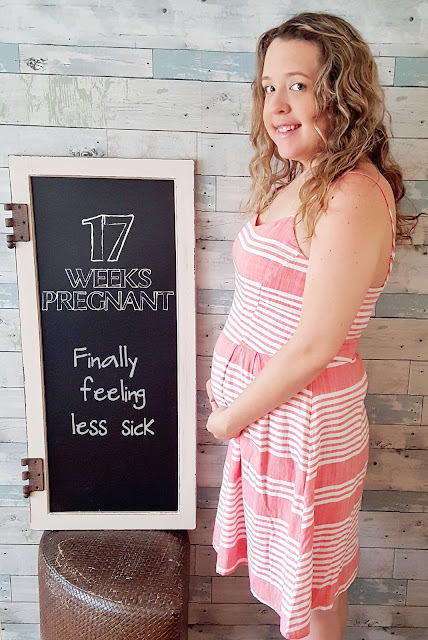 If you've followed the blog, you know this was absolutely something we wanted but definitely something that we had longed for, for many years... so finding out we were expecting without medical intervention was so exciting and absolutely amazing. Regarding amazing things, seeing our baby on our first ultrasound at 5 weeks was the best feeling in the entire world. Another amazing thing, telling our friends and family. 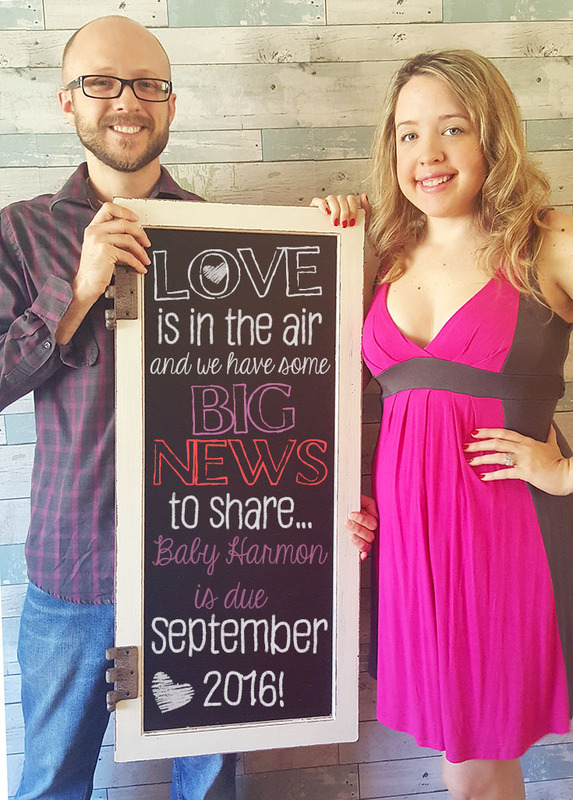 We shared the big news with mine and my husband's family during a visit up to the midwest and the outpouring of love was amazing. From tears to hugs, it was a blessed trip and an amazing feeling to finally share our news at just 6 weeks. My niece actually told me she was so excited to have another cousin and thanked me for my baby's life... Can you think of anything that would melt your heart more than that? I can't. We announced the fun on social media on Valentine's Day and that was amazing as well. 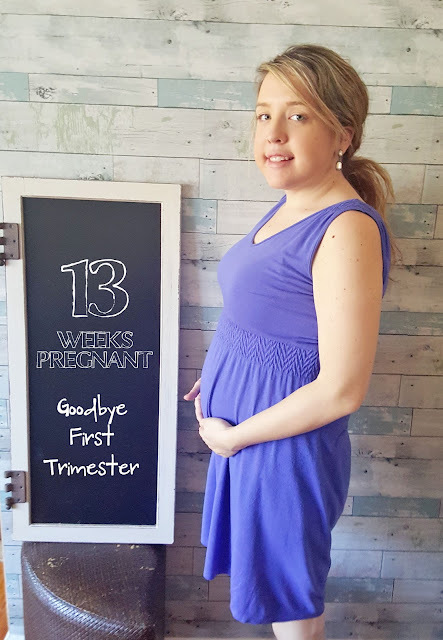 And... now that I've given you a quick catch up session on the joys and sorrows of the first trimester with this pregnancy, I suppose I can go ahead and share the up-to-date deets on this bump of mine. I'm rocking a 20 week bump and it's seriously getting heavy already. These past few weeks I've developed, what seems to be, pregnancy insomnia... but again, it'll all be worth it in the long run. While I'm lacking sleep and feeling thick, the past few weeks have also been full of fun. We bought the perfect crib, we're receiving some totally awesome items from a range of amazing companies for my upcoming Baby Shower Gift Guide (stay tuned for some super cool giveaways for you guys), AND we recently found out the gender and started to feel our little "pineapple" kick. 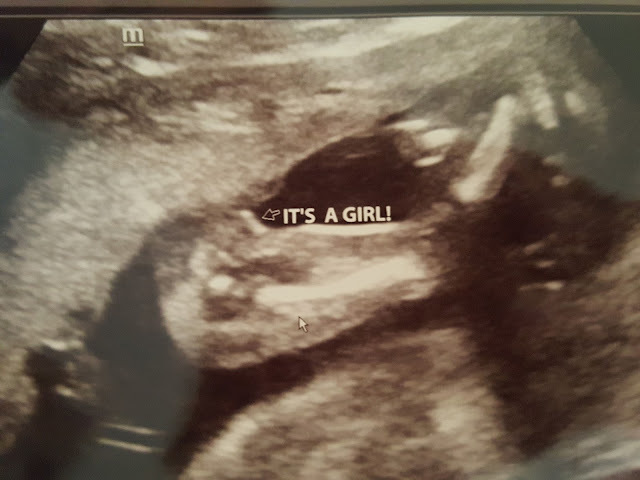 Finding out the gender was more difficult than we anticipated... Our ultrasound tech at the Doctor's office couldn't confirm or deny her gender with 100% certainty so she refused to disclose any information. If you know me, when I have my heart set on something, I want it to happen... so after leaving our appointment slightly disappointed (but also totally happy because the baby was healthy), we decided to book an appointment at a local boutique that offers ultrasound scans. 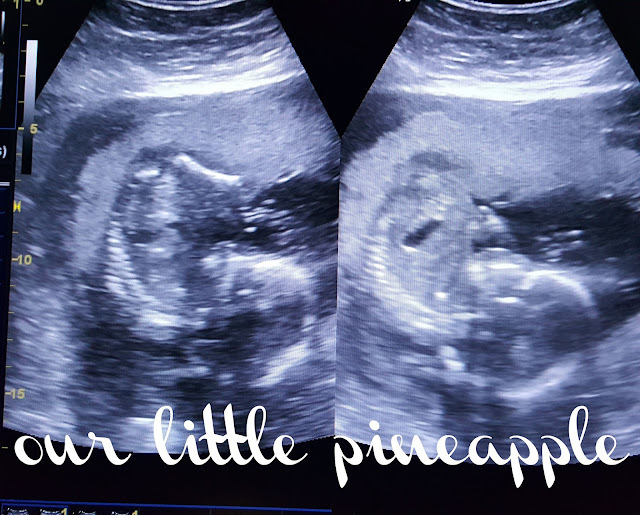 We should've known with a stubborn attitude and a demanding little personality that required a second appointment that our little pineapple was a female... but alas, we didn't consider those facts until later! Luckily, we were able to book an appointment on the same day and see our girl and all her glory in a spread eagle position after getting yet another extensive scan. That's right, I'm going to be sharing plenty of princess-related fun in the future and I'm super excited about that fact... I always thought I would be the mom of only boys, but now that I know my pineapple is a gal, I'm more than happy to be dressing her up in tutus and bows and you better believe I'm ready for a million rounds of Pretty, Pretty Princess and plenty of pink all through out her life! 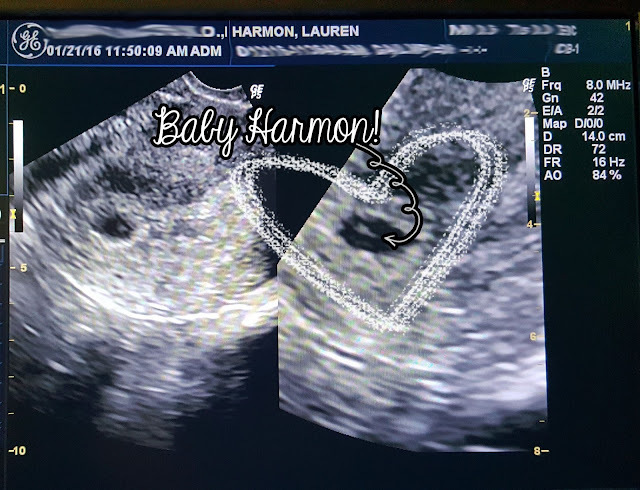 With all the excitement of her being difficult and having to schedule a second appointment, I was able to put some other news we received during our appointment on the back burner. That news is a little less joyful, I have complete (or total) placenta previa... which is a complication of sorts, but isn't the worst situation so I have no need to seriously worry, from my understanding. My doctor mentioned that most women that have this condition during the 2nd trimester anatomy scan tend to see improvement before delivery and some have their placenta completely move... while he told me not to google and worry myself, I'm the type to investigate so, of course I did just as he instructed me not to do. The good news: I'm not on bed rest, I've had no bleeding, and I feel our little girl kicking fairly regularly so I have all the faith in the world that everything will be just fine. Plus, I get an extra ultrasound at my doctor's office out of the deal, to ensure everything is looking groovy... So I'm okay with that... and hope the results from that scan are phenomenal. With that said, if you're a mama that was diagnosed with placenta previa (any of it's various stages - complete, partial, etc), I'd love to hear from you. 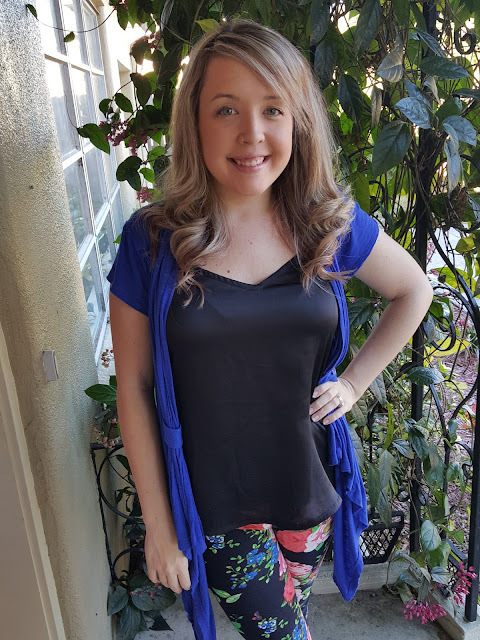 I'm always wanting to learn more from other mama's so let's chat! She's most active after I drink a bottle of ice cold water and least active when her daddy reaches over to feel her - stubborn like her mama, already. She has been nicknamed "Blake" by my two (almost three) year old niece and while we think that name is cute, it likely won't actually be her name... but I have yet to convince my niece otherwise. This same niece loves talking to her in my belly over speaker phone... she's pretty much the sweetest. 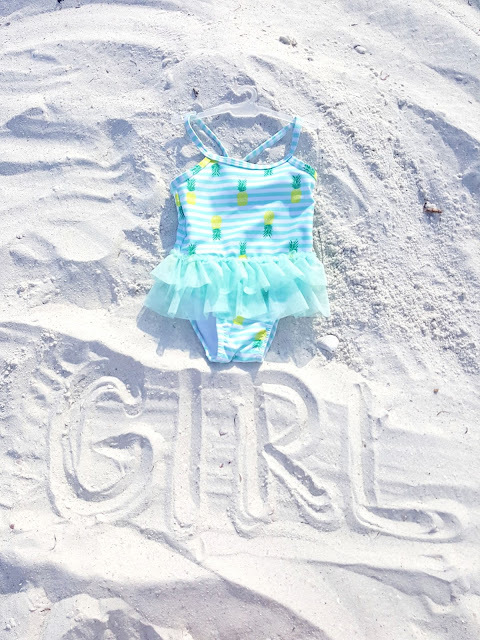 We've decided that the theme of our little girl's room will be a mixture of mermaid and tropical/beachy, which fits our Florida lifestyle perfectly... and since I love mermaids, I'm more than excited to share all the fun little details! I suppose now that I've nearly written a book, I'll end the first pregnancy update here. 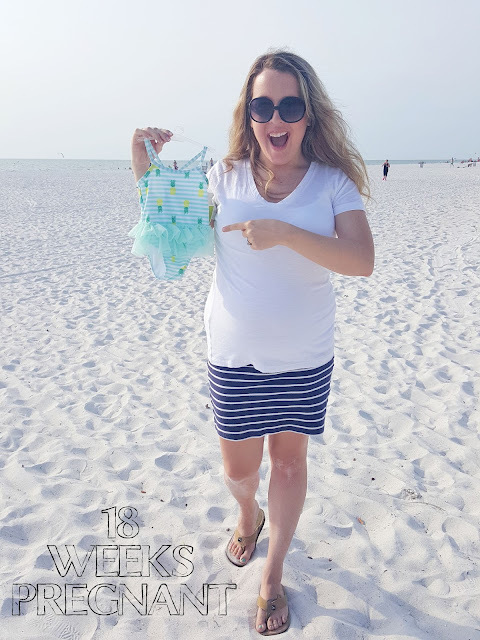 I'm going to do my best to keep track of this journey on the blog from this point on, but I also want to mention that I don't plan on making Lauren Paints into strictly a mommy blog. This space is for sharing the things I love, so as you can imagine, my growing girl is going to be talked about but she won't be the sole focus. I'm so thankful for this little space, where I can share my thoughts with what feels like thousands of my best friends... so let me thank you, for being a part of this journey with me and my gal! This is what a girl that finally doesn't feel sick at 18 weeks looks like! Now, I'll be honest and also share with you, I'm going to go ahead and indulge a craving and eat a big ol' slice of chocolate cake in a few moments. So tell me, are you expecting? Do you have little one's of your own already? 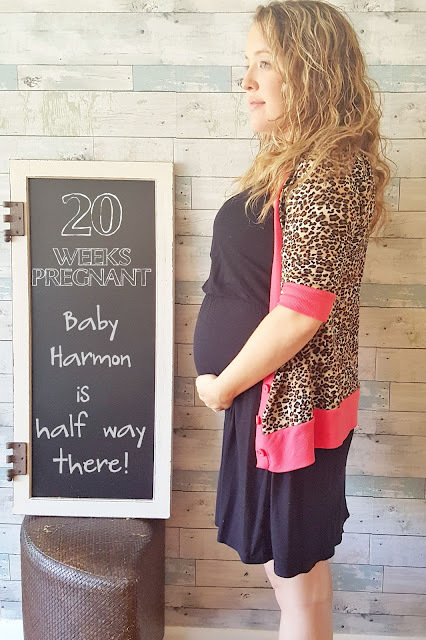 Tell me all about your pregnancy in the comments below, as I mentioned above, I love learning from other mama's!